With 2016 coming to an end, it’s time to welcome the New Year with a bang. No matter how the past year has been for you, the last day of 2016 still calls for a celebration. DiscoverSG has rounded up a list of 13 places in Singapore for you and your fellow comrades to enjoy a kickass 2017 countdown party! You can look forward to a memorable night of fun. From feasting to partying under the stars, there’s something for everyone. Located within a historical building, 1919 Waterboat House offers one of the best views of the city’s fireworks display. The alfresco rooftop restaurant presents a scrumptious seafood buffet and an unobstructed view of Singapore’s CBD skyline and Marina Bay. On New Year’s Eve, get ready for a massive 2017 countdown party hosted by local DJs and performances by bands and artists. From rock and rolling with local band 53A to a larger-than-life boombox party and appearances by Vernon A, Justin Ang, Simone Heng, and Kimberley Wang from local radio stations, there’s plenty to groove to at Clarke Quay. Besides that, there’ll be fabulous parties happening at Attica, f.Club, Hooters, and plenty more! Looking for a laid back night? Look no further! There’s something for everyone at the Empress Lawn this 2017 countdown. There’ll be music performances and free movie screenings such as X-Men: Days of Future Past. Enjoy a picnic under the stars before ending the night with fireworks display. Surrounded by iconic landmarks, Marina Barrage presents a magnificent view of Singapore’s cityscapes and the fireworks display. From kite-flying sessions to picnics, the luscious plains serve as a great location to accommodate crowds, both large and small. Party under the stars to pumped-up beats and raving tunes with your friends at Singapore’s ultimate beach 2017 countdown party. The epic 12-hour event offers a line-up of exciting events and performances by top DJs from around the world, such as Dutch DJ and producer Quintino. Get you beach body ready for a nightlong of partying! Ranked as one of the world’s finest beach clubs by Condé Nast Traveller, the Tanjong Beach Club is presenting a special two-day New Year Beach Extravaganza for the beach bums. Participants can look forward to a 2017 countdown under the stars and wake up to a hearty seaside brunch. Have your own private New Year’s Eve 2017 countdown party in the sky on the Mount Faber line. The package includes a platter of party snacks and champagne, and the opportunity to relish the sensational close-up display of fireworks. On the night of 31 December 2016, this kid-friendly magical event will be filled with LED street acts and performances. Some of the rides will be open all night, while pyrotechnic displays will light up the attractions at the stroke of midnight. Celebrate New Year’s Eve with celebrities at the ‘Rock On! 2017 Countdown Concert’. 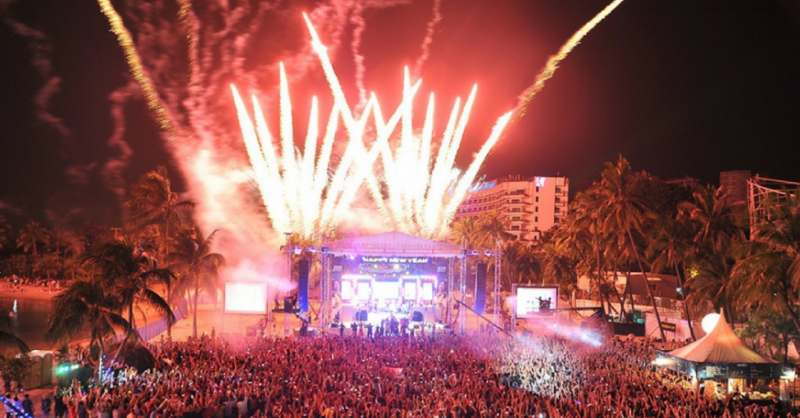 This ticketed event features a stunning 8-minute fireworks presentation and a line-up of regional and local acts, such as R&B singer Alicia Keys and Taiwanese pop star Rainie Yang. Usher in the New Year in style with rocking performances by acoustic band Ngak and friends and reggae band Bushmen. As 2016 is coming to a close, celebrate the joyous occasion with a delectable five-course meal and free flow of alcoholic drinks at Hard Rock Cafe Singapore. Please note that reservations are required. Escape the heat into a world of cool and fun at The Rink. Get into the festive spirit and celebrate an unforgettable wintry 2017 countdown with your family and friends. Countdown to 2017 at Super Loco’s ‘Acapulco Gold’, a New Year’s Eve Fiesta filled with dancing and music by DJ duo Fat Fish Familia. Enjoy a delightful Mexican feast and cocktails alongside the stunning Fullerton Bay waterfront. If you’re still wondering how to celebrate New Year’s Eve and get into a 2o17 countdown groove, the places listed above will certainely be handy for you. So grab your friends and loved ones, bid goodbye to 2016 and welcome 2017 with a blast! Also, read Countdown At 12 – Usher In The New Year With 12 Hours Of Free Flowing Drinks!